These are world première recordings in Sterling's Romantic Swiss music series. Hans Huber was amongst the leading musical personalities in the German-speaking part of Switzerland in the years around the beginning of the 20th century. He was born in 1852 in a small community in the north-west Swiss canton of Solothurn. He studied under Carl Reinecke in Leipzig and subsequently taught music in Alsace from where he made his first contacts with musical life in Basel where he moved in 1877. In 1892 he achieved celebratory status with his Festpielmusik zur Klein-Basler Gedenkfeier. He became diabetic and died in 1921 during a stay at a spa in Locarno. He composed masses, choral works, five operas, eight numbered symphonies, solo concertos for piano, violin and cello plus a large amount of chamber music, numerous songs and innumerable piano pieces. 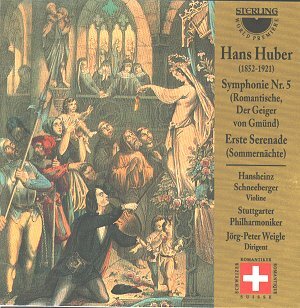 Huber's 'Romantic' symphony is a vivid programmatic work comparable to Raff's Symphony No.5 'Leonore'. Huber's work is based on a poem (reproduced in full in the booklet) that celebrates a legend associated with the statue of St Cecilia (the patron saint of music, of course) that stood in the chapel in the town of Cmünd. The legend relates how a poor fiddler came in distress to the chapel and played with such sad eloquence that it moved the saint to pity so that her statue moved and gave the fiddler her golden slipper. The fiddler rushed out to exchange the shoe for bread but when the shoe was recognised, the fiddler was accused and tried as a thief and condemned to death. On the way to the scaffold the fiddler pleaded to be taken back to the chapel to pay his last respects to Saint Cecilia. With this wish granted, the fiddler played once again before the statue of the saint and a second miracle occurred when the statue gave the fiddler her other slipper. The townsfolk were awestruck and released the fiddler who now became a hero. At length he departed on his merry way but from henceforth the townsfolk always respected and honoured visiting fiddlers. Now Huber weaves his music around this legend and poem but he does not translate the story literally but uses it in a stylised form. He imagines, for instance, the fiddler's circumstances before he arrives in Cmünd. Huber is, of course, provided with a golden opportunity to utilise a violinist as soloist to personify the fiddler and the work proceeds very much in the spirit of Berlioz's Harold in Italy. Huber is careful not to let the fiddler become the star attraction - his part is well integrated into the orchestral fabric. The first movement is in two parts. First there is a 6 minute Allegretto tranquillo section also marked pastorale. This is a bit of a misnomer because it isn't that tranquil - in fact one gets the impression that Huber is in a hurry to start the narrative because it begins with march-like figures as if he was walking purposely through the landscape, without enjoying it, to carry out some purpose. A quirky trumpet fanfare introduces the fiddler but the pace does not relax much and one imagines a sort of Korngold Sherwood Forest backdrop where there is conflict and hidden danger. The second part of this 21 minute movement is in the form of a theme and variations. This gives Huber the chance to take his fiddler over broad plains, through woods (complete with twittering birds etc), allows the fiddler to meet a jolly band of soldiers and apparently makes fun of them (by the sound of this interpretation) and to meet his 'beloved-to-be' to some florid, rather scented romantic music (often impressionistic in style); although their amours are interrupted by a violent storm. All the while, the fiddler (Hansheinz Schneeberger) makes the most of all the expressive opportunities presented by these scenarios. The relatively shorter (8 minutes) second movement, one assumes, is the song(s) that the fiddler plays in front of the statue of St Cecilia. The programme sheet at the première gave the title 'The fiddler's songs: Love and Sorrow for this movement. The third movement (16 minutes) is spectacular and the influence of Richard Strauss (particularly Till Eulenspiegel) is apparent. It commences as a march to the scaffold. The music suggests outraged Civic pride and the protestations of a perhaps not so innocent fiddler, then there is a quieter section as he persuades his captors to allow him to pay his last respects in the chapel. There follows a magnificent climax, with full organ, celebrating all the pomp of the Church as the second miracle occurs. The work ends quietly as the fiddler goes on his way. This is a most interesting and engaging work which deserves to be better known. It receives a full-blooded and spontaneous performance form soloist and orchestra. The other work in the programme is enchanting. Huber's 'Summer Nights' Serenade is pleasant, relaxing, undemanding music. The first movement is rather classical/early Romantic in style. Mendelssohn comes to mind more than once. There is a rustic quality but also a feeling of national pride which is also evident in the finale. The scherzo second movement is fast very bright and untroubled; I had the mental picture of a romantic carriage and horse ride. I carried this imagery over into the Adagio third movement that is also marked Nocturne. Here I imagined the carriage stopping at some lovely vantage point as the lovers caressed under the moon and stars. This movement is dreamily romantic with some fine writing for horns and strings. The finale is a joyous celebration with dancing that reminds one of Liszt and Brahms in Hungarian mood. A recording to discover and savour.